Ohsweken, Ontario – January 9, 2014 – The 2014 racing schedule for Ohsweken Speedway was officially released on Wednesday. The schedule features 20 events, beginning with the 19th annual Opening Night on Friday, May 16. All weekly racing events at the speedway will begin at 7:30p.m. again in 2014, with the new Crate Sprint Car division adding even more great racing to the schedule. Regular weekly racing events will include 20 lap features for the Corr/Pak Merchandising 360 Sprint Cars, and Affordable Towing & Recovery Thunder Stocks, 15 lap features for the Crate Sprint Cars and HRW Automotive Mini Stocks, and a 12 lap feature for the Gale’s Auto Aftermarket Bombers. Racers will hit the track for the first time in 2014 with a Test & Tune Night scheduled for Friday, May 9, while the season concludes with the 10th annual Canadian Sprint Car Nationals on Saturday, September 13. Three marquee events highlight the schedule, including the Northern Summer Nationals scheduled for a Monday night again this year, with Corr/Pak Merchandising 360 Sprint Cars, Crate Sprint Cars, DIRTcar 358 Modifieds, and HRW Automotive Mini Stocks all on the July 28 card. The “Greatest Show on Dirt” returns to Ohsweken on Tuesday, July 29 when the World of Outlaws STP Sprint Car series will contest the 8th Annual Six Nations Showdown, joined by the Affordable Towing & Recovery Thunder Stocks, and Gale’s Auto Aftermarket Bombers. The track will be closed on Friday, August 1, following the two special weeknight events. 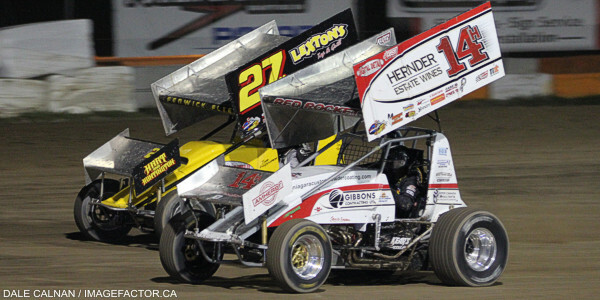 The 10th annual Canadian Sprint Car Nationals weekend will include the Sprint Cars and their Ohsweken Shootout during the Night Before the Nationals on Friday, September 12, plus the HRW Automotive Mini Stocks, while Saturday, September 13 will feature the $12,000-to-win CSCN Sprint Car event, plus Affordable Towing & Recovery Thunder Stocks. Ohsweken’s weekly Corr/Pak Merchandising Sprint Car competitors will take on some of the best teams in the northeast in 3 challenge events this season, with the Patriot Sprint Tour visiting on June 20, the Southern Ontario Sprints on July 4, and the Empire Super Sprints on August 8. Two special memorial events also highlight the schedule, with the running of the Brock Leonard Memorial 50 for Affordable Towing & Recovery Thunder Stocks on July 18, and the Art Hill Memorial 42 for HRW Automotive Mini Stocks on August 9. The Sportsman Shootout returns for a second consecutive season, with the DIRTcar Sportsman Modifieds set to join the weekly Friday night racing divisions on June 27. The TUSA Canada West Mod Lites will join the program on June 20, and August 22, while Vintage Cars will be part of the action on July 11. The track will celebrate “Christmas in July” and Autograph Night on July 25. Opening Night on May 16, and the Season Championship on September 5 will both include extra-distance feature events for all 5 of Ohsweken’s regular weekly racing divisions. Stay tuned in the coming weeks for announcements regarding advance ticket ordering information for the Northern Summer Nationals, World of Outlaws Six Nations Showdown, and Canadian Sprint Car Nationals. Drivers rosters for the 2014 season are already taking shape, and the 2014 roster page is regularly updated on the track website. Visit www.OhswekenSpeedway.com to keep an eye on your favourite driver’s plans for the 2014 season.